Back to NYC after a fabulous time with family and friends in Toronto. As much fun as that was, I was super excited to see my friends in NYC again especially since one of them was celebrating his 30th the next day. His birthday was all planned out. 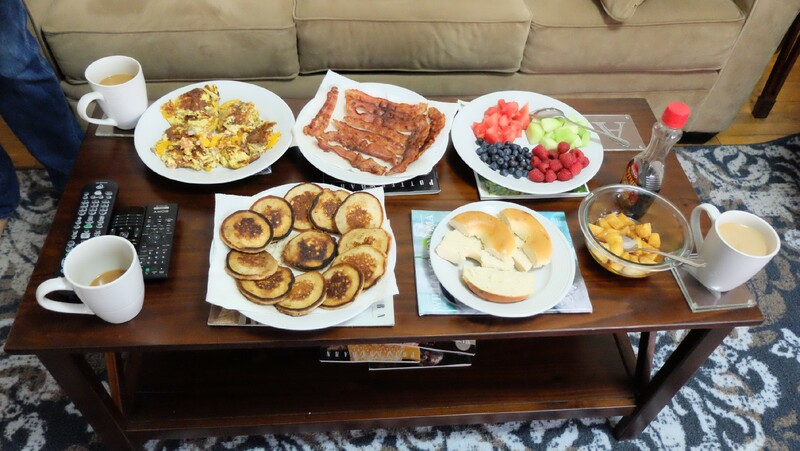 We prepared an amazing brunch to start our day. The first few days in NYC felt like the city was pumping energy into me! I was out everyday and there was a lot of sight-seeing and really long walks. Now this is what tourists usually do but based on how I spent my time in Boston I was amazed at how much I did. Fast forward a few days and I started to feel a bit drained. So my friend’s girlfriend, who feels equally like a friend to me now, took a day off to show me around and I was really excited at having a girl’s day out. I was ready to go with her flow as she knows NYC REALLY well. We started with ground zero which has another building in place of the twin towers and a memorial structure that’s under construction, nothing much to look at to be honest. The twin towers were a wonder when they existed and their non-existence is a wonder in itself. People go to the site to see and take pictures of what “should have been”. I decided to take it easy during the day today and have a late start as my friends were taking me for a Broadway show in the evening and I didn’t want to be too tired for it. After waking up at 10am (thank you to whoever rang the doorbell) and having a chilled out morning I head out to Manhattan to see the Rockefeller center which I thought was one building. I entered what I thought was the center and remember thinking, “right, this looks like a glorified shopping complex”. I got a map from the visitor center just to see if there are any must-see things in this building. That’s when I learned that the Rockefeller center is not one building but 12 buildings! It’s the most recognized commercial property in the world and consists of 109 stores , an ice rink, gardens, theatre, public artwork and an entire floor dedicated to dining. The center has 8million square feet in rentable property which is the equivalent to 31 Gherkin buildings in London. Wow! Now I was impressed. I just walked around for a hour, I didn’t buy anything or eat there but I could not help but be amazed. It truly is a “City within a city”. Earliest I’ve left home in a 2 weeks, 10:30am! First stop, pancakes!! I know I know, I said last night I wont but that was 12hrs ago! My friend took a day off to show me around, the first restaurant didn’t have pancakes as it wasn’t the weekend (I thought Americans ate pancakes everyday??) so we went to a diner coz they would surely have some and they did! Phew. 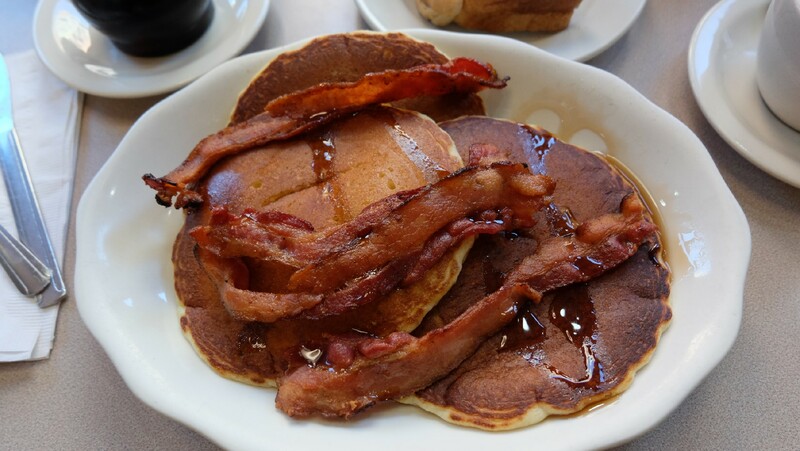 I ordered pancakes with butter and syrup with crispy bacon. (Meat and sugary syrup don’t go together in my head and so I’ve always wanted to know what the fuss was all about). Wow, NY, what can I say! Right, so even before I came here I wasn’t sure what I felt about it. I was obviously super excited to see my friend after almost 3 years but NY reminded me of London, a busy busy city, and I wasn’t sure I was ready for the madness. But I put that out of my mind, packed my bag and left for NY.